Known as the master of prophylaxis, Anatoly Karpov would positionally strangle his opponents in order to crush them during his games. Karpov was also involved in one of the greatest chess rivalries in history. The 12th World Chess Champion, who took over the title after Fischer forfeited it in 1975, played in eight (!) consecutive World Championship matches with the last five of those all being against Garry Kasparov. This storied rivalry set the tone for the following years of chess, with many of the games in these matches becoming classic historical games that have been studied countless times since. 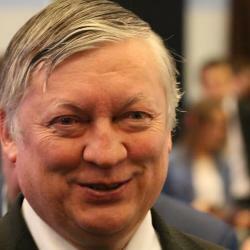 Anatoly Karpov learned to play chess at the age of 4 and improved quickly. He was accepted into the chess school of Mikhail Botvinnik when he was 12 years old and with Botvinnik’s instruction he was able to skyrocket into the world’s elite players. In 1969 at the age of 18 he became an International Master and one year later he became a Grandmaster. He qualified to play against Bobby Fischer for the World Championship in 1975 but the match never ended up happening because Fischer’s demands were not met and he forfeited the title. Because he knew that people may have viewed him having the title as a fraud, Karpov began to play in every single large tournament in order to prove to everyone that he was the real deal. He continued to defend his title against all players until 1985 when Garry Kasparov challenged him for the second time. It was then that Kasparov proved victorious and this rivalry turned history as they played in five world championship matches in a row! Eventually, Kasparov proved to be the final victor but Karpov has still definitely proven his strength. Karpov won a large tournament as recently as 2012 which shows that he is still a great player who hasn’t lost a step as he has aged.